"The stone walls of the chapel seem to grow out of the earth itself, while the pristine waters of the stream cascade in the distance. Deer, birds, rabbits, even a frog gather in humble and silent witness to the unity and harmony of the creation. And over all, the glorious vault of the heavens unfolds another glistening morning." Phone - Call us to place to place an order over the telephone. 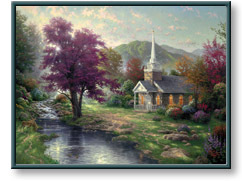 Streams of Living Water copyright © 2000 by Thomas Kinkade is prohibited from being copied.